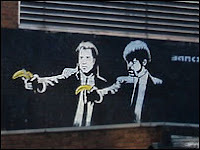 Apparently Banksy's wonderful Pulp Fiction with Bananas has gone... It's not quite clear whether this was an accident or whether the Transport Police cleaned it up. Either way it's a pity, not because it was worth 300k (how on earth would anyone sell it?) but because it was funny. I suppose the graffiti I found below on April 1 is a Banksy too. Who knows? Wonder what it's worth if it is..?